Well, we’ve decided to transfer our blog from WordPress to Blogspot. Our new web address is http://www.thathoneyhoneyblog.blogspot.com. Come by and check us out! The grass is soft against my pale, bare feet. My hands are clenched; not in anger, but as a ward against the cold air. Though the spring is pleasant, its nights are still filled with a settled, slient chill that sends shivers creeping down my neck, into my arms, and across my back, wrapping around to engulf my lungs in a tingling but clamped embrace. I feel as though an invisible claw is squeezing my just enough for me to feel, and loathe, its presence. My legs begin to move, swishing forward, chasing each other across the ankle-deep grass; a soft rhythm is forced upon the ground: a rhythm that even I, its creator, cannot hear. Each bounding step leaves a new mark upon the ground. There is a long stretch of footprints – plaves where the early-morning dew has been pulled from the smooth grass onto my small feet. I continue to run. I refuse to slow, or falter, or let weariness seep from my weak legs and aching chest into my brain. I have only one conscious thought: I must run. The black sky is as vast as the field upon which my feet are so softly and rapidly pressed. The huge, white moon stares down at me stoically, indifferent to my plight. It is my burden. It is why I must run. The light by which I can see the mud that cakes my feet is the light that allows any creature, man, or beast to see my white dress, my pale face, and my dark hair that glints with every footfall. The night has become colder: a blanket of chill wraps around me, whispers into me. I can hear nothing but my own uneven gasps and the Thump Thump Thump Thump Thump of my quickened blood sweeping through my ears in methodical rushes. As air is forced from my throbbing lungs, it freezes into glistening crystals, which wash over my face and melt upon my brow, my nose, my flushed cheeks – making my whole face so numb it becomes a mask: unfeeling and unmoving. I stumble and fall. My momentum pulls me forward into a tumbling roll until I slide to a stop. I cry out in shock. I can feel nothing! I heard my arm crack, saw it bend halfway up my forearm, yet I feel no pain. A wild dementia fills me. It chases away my hope like a wolf chases a rabbit: quickly, with scorn for the diminutive size of its prey. Lying there, trembling against the crumpled grass, I let my shoulders sag, stop trying to push myself up with my feeble arm. Shadows lurk at the corners of my eyes; even the moon has dimmed to a blurry grey. I hear voices behind me. My original urgency rushes up my spine, the thoughts swirling through my head, drowning out all others. I must not stop. They’re after me, I must not stop. They’re after me, I must not stop. But another thought rises through my thickening brain. I cannot move! I had stopped. I lost the iron will that has grasped my body for so long, and do not have the focus to move the arms and legs I can not feel. I will be caught. I am no longer able to feel dread. My body performs an involuntary shudder that I cannot feel, and my thoughts become a distorted cacophony of lights and sounds. 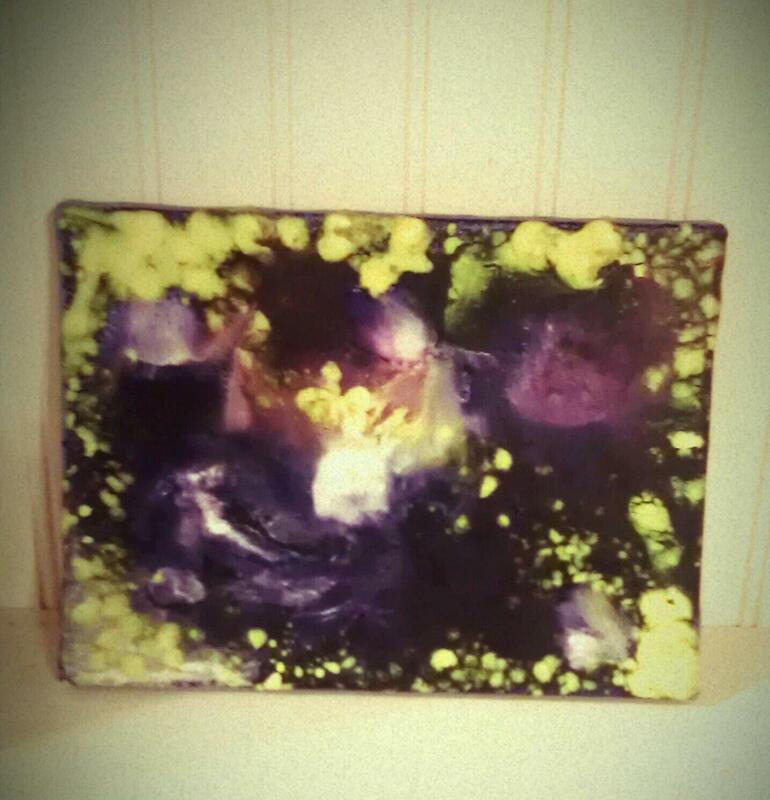 My newest favourite form of art is melted crayons. The colors are so bright and blend so beautifully! 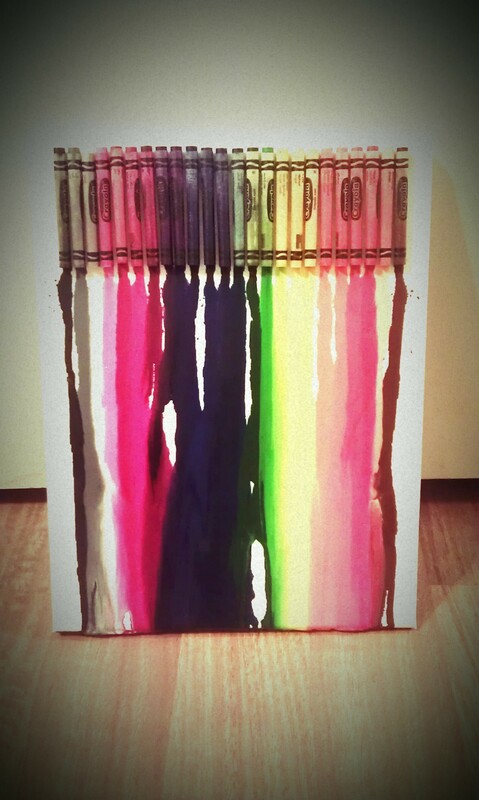 (And, honestly, who doesn’t like the smell of melted crayons?) Crayon art is fairly easy, if slightly messy, to make… you simply break, grate or chip off pieces of old crayons, arrange your shavings on a canvas (you can even use one that has been painted on!) and attack it with a hairdryer. Also, an embossing gun works well, it gets much hotter and therefore melts the wax faster. Another way to do it is to hot glue crayons along the top of your canvas, stand it up and let the melted wax drip down the canvas. Hooray! Our first post! The goals of this blog are to share what we love and share how to do new things. We are a group of teen girls with a love for all things vintage, bookish, fashion related and crafty. We look forward to having this blog and hope that you will enjoy it as well! Posted in Uncategorized and tagged First Post. Bookmark the permalink.